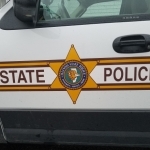 Illinois State Police (ISP) officials have announced the arrest of 55-year-old Craig W. Dittmar for his involvement in the March 28th, 2019, fatal crash which resulted in the death of Trooper Brooke Jones-Story. On Thursday the Stephenson County State’s Attorney’s Office approved charging Dittmar with two counts of Reckless Homicide (both Class 2 Felonies), and one count of Operating A Commercial Motor Vehicle While Fatigued – Causing Death (Class 3 Felony). An arrest warrant was issued for Dittmar and the bond for the warrant was set by the judge at $250,000 (10% applies). Dittmar was later taken into custody and lodged in the Stephenson County Jail where he is being held in lieu of that bond.